As we’ve seen, capitalism survives by creating two fundamental crises: one ecological, and the other social. Therefore the forces that will bring it down are an alliance of nature and humanity, both unable and unwilling to exist merely as commodities to be profited from. The death-urge of industrial capitalist production cannot withstand the forces of life unleashed in resistance, and this is exactly what we’re seeing now. Let’s look at each one briefly. Capitalism cannot exist without ever-increasing amounts of energy, resources and human labor being commodified, or turned into property to be bought and sold on the market. As the excellent video “The Story of Stuff” describes, the capitalist machine – from resource extraction, to production, to distribution, to consumption, and finally to waste – is a linear system on a finite planet, which by definition cannot be sustainable. It is apparent that we are living in the late capitalist period because the system has ballooned to such a massive scale over the past decades that the entire surface of the planet is scoured for resources to maintain the colossal rate of production, or in fact, constantly exceed itself. Many resources can be substituted during a shortage. For example, as fish populations are over-exploited and fish meat becomes more expensive, people can substitute chicken. But some resources are so essential to the functioning of the capitalist system that there are no substitutes, so their shortage threatens the very ability of the system to persist. Oil is the lifeblood of capitalism; there is literally nothing on this earth that can replace it as the dominant fuel for the engine of global capitalism. It’s not just that 40% of energy comes from oil, making it the world’s #1 energy source, the key point is that the particular applications of oil are vital to the entire economic structure. For example, 99% of the world’s pesticides are chemically produced from oil (and almost all industrial fertilizers derive from natural gas), which means the entire industrial mode of agriculture that has taken dominance over the world’s farmland depends upon abundant cheap petroleum. In fact, including tractors, chemicals, packaging, distribution, and cooking, every single calorie of food in the United States requires at least 10 calories of fossil fuel energy to bring that food to the plate. The pharmaceutical industry, chemical, plastics, and military are equally dependent. In addition to being found in just about everything we consume, petroleum is now also necessary for fueling the extraction, production, packaging, and distribution of all other resources. Most crucially, oil now powers 95% of all transportation, in the form of gasoline, diesel, and jet fuel. By definition the global economy depends on the rapid transport of people and resources on a global scale, which means burning oil and dumping billions of tons of carbon into the atmosphere, causing global warming and destabilizing the Earth’s climate. Meanwhile, because oil is such a powerful resource, states necessarily view it as a strategic imperative to maintain access to supplies. The quest for cheap and available oil therefore becomes a prime motive for military action and warfare, as we’ve seen in the actions of the US in the Middle East, where 66% of the world’s remaining oil lies. Warfare and climate chaos stand out as particularly devastating consequences of the massive rate of oil consumption, but the reality is that the entire global assault on human justice and natural ecosystems would in many ways not be possible without being fueled by cheap and abundant oil. Luckily, oil as a resource is limited in supply (imagine the destruction if it weren’t), and in fact according to a growing chorus of geologists, the worldwide supply of oil is now reaching its ultimate maximum level and will soon enter decline. The evidence shows that the global peak oil production is here today. This historic event is occurring approximately 40 years after the peak discovery of oil, in the mid-1960s. Since that time, less and less oil has been found worldwide, while demand has skyrocketed. This isn’t the place for a full explanation of Peak Oil, but it serves to point out that at least 54 countries have already reached their domestic peak oil, including the United States. Data indicates that the immense run-up of prices in 2007-2008 can best be explained as a result of global oil shortage, which certainly added stress to the financial markets and likely helped trigger the current crisis. The deepening oil shortage will affect the United States and its imperialist project in a unique way. Having risen to power on a sea of oil in the first half of the 20th century, the U.S. reached its peak oil in 1970 and now imports over 2/3 of its consumption. Still by far the largest consumer of oil, using over 25% of global supply, the country is being forced into deeper and deeper debt to pay for it. This enormous trade deficit is only counteracted by the willingness of foreign countries from whom the United States purchases most of its stuff (Saudi Arabia for its oil, China for its consumer goods), to recycle their dollars back into the US by purchasing Treasury Bonds, stocks, real estate and other dollar-denominated assets. As U.S. financial markets crumble, how long until these foreign countries decide their investments are safer elsewhere, and pull the rug out from under the Empire? In the face of this crisis, there has been and will continue to be corporate-driven hype about “alternative fuels” that could theoretically be used to replace oil, including ethanol and tar sands. But none of these fuels can provide the enormous energy that oil does with as little energy required to supply it, which makes them highly suspect in terms of fueling further economic growth. Also, the most hyped of these fuels are even more destructive than petroleum. For example corn ethanol has so far done more to fuel a global food crisis than anything productive, as crops get diverted from hungry mouths into gas tanks. 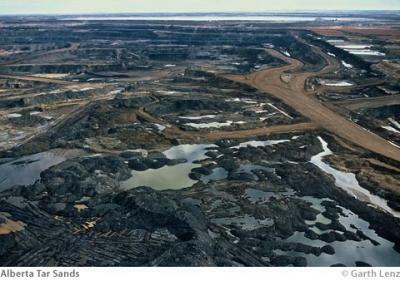 But literally nothing has shown itself to be more devastating to living systems than the Alberta tar sands. Currently the largest industrial project in the history of the world is set up around trying to create usable oil out of the mucky bitumen of Alberta, Canada – with questionable output given the $500 billion price tag. In order to produce a single barrel of usable synthetic fuel, about 3-5 barrels of super-heated water must be used to spray some 2 tons of tar sands that were dug from enormous pits. The corresponding 3-5 barrels of runoff is then dumped into enormous toxic pools of wastewater/sludge, before each barrel of bitumen is infused with 1,400 cubic feet of natural gas, finally creating a fuel that releases three times the greenhouse gases of conventional oil. If the tar sands operation continues to scale up to a level that could replace convention oil consumption, it would create a toxic pool the size of Lake Ontario. Meanwhile, thousands of square miles of Albertan boreal forest are being clear-cut, migratory bird populations are threatened, and indigenous communities are developing unprecedented cancer rates. Those promoting tar sands as an “alternative fuel” unconsciously echo the insanity of US generals during the Vietnam War who declared, “We had to destroy the village in order to save it”, this time speaking of the planet as a whole. Oil is just one of the many resources which are rapidly becoming scarce – coal, natural gas, uranium, phosphorus, copper, even water cannot be used at the same enormous rate that industrial capitalism demands. Oil is exceptional in regards to how adaptive and powerful it is, but the basic fact is that the economy cannot expand indefinitely on a finite planet. It was inevitable that a system built on transforming plants, animals, minerals and human life into money would either A) destroy the planet or B) go bankrupt when it ran out of fuel to grow. We should be thankful for the arrival of option B on the scene, and recognize nature’s revolt as the best opportunity for humanity to liberate itself from this system and realize a sustainable future based on freedom, justice and democracy. Indeed, although the media has tried to hide it, a global movement towards these human aims has been building and now emerges as the second great protagonist in capitalism’s breakdown. As long as injustice has existed in the world, regular people have been working to undo it. Those in power teach us the opposite – that change comes from wealthy or powerful individuals: Lincoln freed the slaves, Martin Luther King won civil rights, Barack Obama is bringing change to Washington, etc. These are myths designed to disempower the population so the elite can continue to run the show. The truth is that ordinary people like you and me fought the American Revolution to free the colonies from tyranny, and worked for decades for the abolition of slavery; it was average women who banded together to win the right to vote; it was common workers who organized unions and won the 8-hour day; millions of typical black Americans who sat in, marched, and braved police dogs to kill segregation; common citizens who committed civil disobedience to stop all construction of new nuclear power plants in the US since 1979; normal lesbians, gays, bisexuals and transgendered folks who demanded their rights be recognized as human rights, despite ongoing heterosexist attacks. All of these systems of oppression have been undone by regular people getting together in grassroots democratic social movements to overturn the power structure and put power directly in the hands of communities on the ground. Change comes from the bottom up – it’s always been that way. What’s new is that social movements around the world have become more connected and strengthened by each other, allowing them to take on larger adversaries. There are entire volumes to be written about the incredibly successful movements of today, but here there’s only space to mention a few highlights. On February 15th, 2003, New York City was overwhelmed by protestors demonstrating against the invasion of Iraq, which hadn’t even happened yet. Half a million students, middle-aged, elderly, children, of all colors, religions and backgrounds had come out en masse to oppose the war. It was hard to fathom, but at the very same moment, over 60 countries and over 800 cities were experiencing simultaneous protests against the proposed war. All in all, an unprecedented 10 million people took to the streets to proclaim in many languages a unified message for peace. And although the protest did not prevent the war, it did succeed in turning public opinion against the conflict, which quickly undermined the United States’ standing in the world. To some, Feb. 15th signified the emergence of the “second superpower” – grassroots social movements – as the strongest opponent of US imperial doctrine. But in fact this wasn’t the beginning; a movement for global justice had been taking shape for ten years prior and was already winning massive victories. The Global Justice Movement arose in the 1990s out of outraged response to Neoliberalism – the doctrine of capitalist governments and corporations in the Global North, especially the US, to extract maximum wealth from the Global South by opening up markets and resources to foreign investment, while undercutting environmental and labor protections. Also known as corporate globalization, the goal of this project was to restructure Global South economies towards exporting raw materials and cheap goods for Northern markets. The global finance institutions of the World Trade Organization (WTO), International Monetary Fund (IMF), and World Bank were the pioneers of neoliberalism, and attempted to force poor nations into inescapable debt so they would be forced to accept neoliberal agreements. When these nations couldn’t pay the extortionate interest rates, the neoliberal institutions would punish them by initiating Structural Adjustment Programs (SAPs), which meant privatizing social services, removing environmental laws, and undercutting worker’s rights to organize. The Global Justice Movement was able to defeat the neoliberal project because wherever global elites met to discuss their latest plans for trade deals or debt schemes, they were met with hundreds of thousands of protestors who knew the effect of these brutal policies. After the massive direct action that shut down the WTO summit in Seattle in 1999, the venues for global trade summits were moved to more and more isolated locations, like Cancun, Hong Kong, and Qatar. But wherever the elites went, the people followed. The unrelenting and growing protest outside bolstered the demands of poor nations meeting inside, especially for Global North nations to stop agricultural subsidies that allow corporate agribusinesses to pump out impossibly cheap food, thereby impoverishing millions of subsistence farmers in the Global South. Representatives of poor nations were able to reject any deals that would keep those subsidies in place, with the support of social movements dogging these neoliberal institutions and drawing attention to their destructive actions. This movement effectively killed the World Trade Organization. Also being shot down was the proposed Free Trade Area of the Americas (FTAA), which would have expanded NAFTA to the entire Western Hemisphere and further degraded legal protections for workers and the environment. Large-scale direct actions were able to stall these kinds of trade deals at the same time that lending institutions like the IMF and World Bank were increasingly nullified by an unwavering voice of protest demanding that land and ecosystems, along with workers and indigenous communities, be prioritized above the desires of financial capital. This slogan is common sense to the majority of the population of the world, who already agrees that another US in necessary, and has been demanding this for decades. At the forefront of this rising tide of revolution has been Latin America. Dominated by colonial powers for 500 years, it wasn’t long ago that the continent was ruled by right-wing dictatorships pillaging their countries and their workers for the benefit of Northern corporations. In just the past 10-15 years this paradigm has completely broken down. In the 1980s and 90s, Latin America was prime testing ground for the neoliberal project, as all its nations found themselves in debt to the World Bank and IMF. But when these institutions demanded Structural Adjustment Programs to privatize social services and abolish labor and environmental laws, it stoked a prairie fire of revolt as millions of poor indigenous and mestizos found their strength in the streets. Social movements rallied against the interference of these US-led financial institutions and trade deals, to shake the continent free of neoliberalism. A striking case study is Bolivia, one of the poorest countries in the Western Hemisphere, where the World Bank demanded and got the privatization of all social services in 1999. In the indigenous province of Cochabamba this privatization included the public water system, which was sold off to the US oil services corporation Bechtel. Immediately, the price of tap water began to rise, eventually tripling and causing the poor to face the real threat of hunger and homelessness as people could barely afford drinking water. At the same time it was made illegal to collect rain water, something the indigenous had done forever. Social movements in Cochabamba seized on this injustice and organized massive protests that rocked the nation and caused a governmental crisis which eventually led to the election of Evo Morales, the country’s first-ever indigenous president. Similar events gave rise to powerful social movements all across Latin America, and resulting left-leaning governments have taken power in Argentina, Bolivia, Brazil, Chile, Ecuador, El Salvador, Guatemala, Nicaragua, Paraguay, Uruguay and Venezuela. In some ways these governments have been a mixed bag, but the more accountable to their country’s poor and working classes the more determined they are to free Latin America from the imperial grip of the United States and use their resources for their public’s benefit, or not use them at all. In the past, when a Latin American government challenged US corporations and their plundering of democracy, they would soon find themselves deposed in a CIA-backed coup. But today, confronted by the power of massive social movements, and since its military has gotten bogged down in hopeless foreign wars, the US reign of terror in Latin America has stalled, as the world saw when the 2002 coup against Hugo Chavez in Venezuela (for challenging powerful oil interests) was quickly reversed by millions who took to the streets in defiance. Such popular rebellion hasn’t been more contagious than in the hills of Chiapas, Mexico, where the Ejército Zapatista de Liberación Nacional (EZLN), an army of indigenous peasant farmers, has been in revolt against the government of Mexico and its neoliberal policies for 15 years. The Zapatistas rose up on the same day that the North American Free Trade Agreement (NAFTA) went into effect, a treaty which they called “a death sentence” because it eliminated protections for the poor to keep their land. These masked Mayans took up arms and made their first “Declaration from the Lacandon Jungle,” with eleven demands: work, land, shelter, food, health, education, independence, freedom, democracy, justice and peace. The Zapatistas have been able to survive government repression by tapping into the support of grassroots social movements throughout Mexico and beyond. In return, the Zapatistas have organized the “Other Campaign” to reach out and listen to people’s struggles, and imagine new ways of working against capitalism. 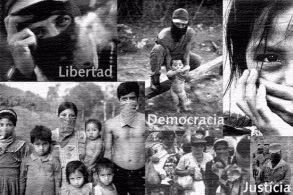 It is this practice of solidarity that not only saves the EZLN, but in turn gives the rest of us the example of successful resistance by common citizens against a much more economically and militarily superior government. The breakdown of the neoliberal project in Latin America was a major defeat for global capitalism, displaying the inherent weakness of the system – it requires our consent in order to rule us. Once this consent is withdrawn, capitalism must either rely on the use of repressive violence, or succumb to popular demands. Next: Part 4. What Comes After Capitalism? Is This the End of Capitalism? Why is it Breaking Down?